Last night, as I walked down the garden with a plate full of goodies for the hedgehogs, I was struck by the beauty of the night… an owl was hooting in the distance, deer were calling across the valley, there was rustling in the leaves and bushes around me, the mist and dew made everything sparkly and slightly ghostly, yet when I looked up the sky was clear and the (almost) full moon was bright. That was the inspiration for this vase, as I noticed the asters glowing with the light from the house, my torch, and the moon. So this morning I picked some of the lilac asters that I haven’t been able to name, as well as some of my Aster pyrenaeus ‘Lutetia’. Then some silvery foliage: lavender, perovskia, buddleia. On a whim, the Heuchera flower went in last, as I passed it on the patio. The resulting vase makes me feel very calm, and reminds me that nature is my inspiration. Thanks to Cathy at Rambling in the Garden, who hosts the “In a Vase on Monday” meme – take a look at some of the vases linked on her post again! Wishing you all an inspired week! 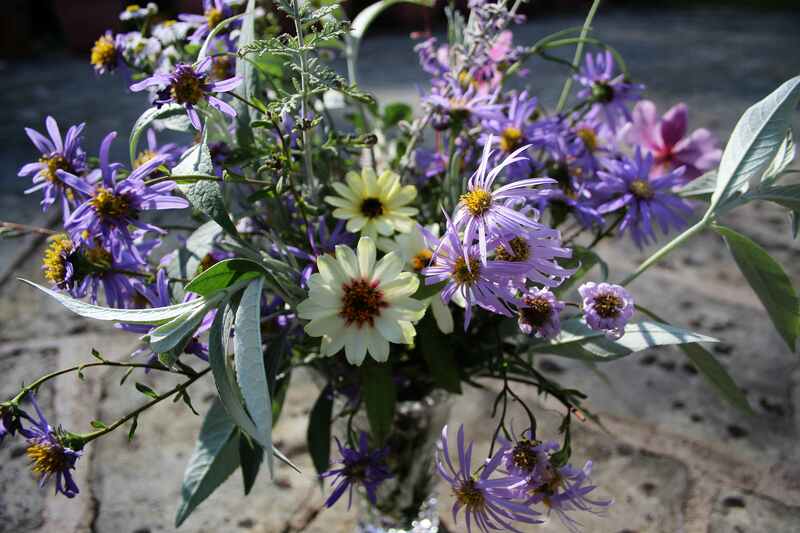 This entry was posted in Garden, In a Vase on Monday, Nature and tagged Autumn, Cut Flowers, Garden, Nature, Seasons. Bookmark the permalink. And your garden is an incredible inspiration too as your flowers are amazing…I love the asters with the zinnia and anemone. Stunning with the silvery foliage and I can see the moonlight vase…perfection Cathy! Perfectly reflects your title, and I liked imagining you walking around the garden in the dark with food for the sweet hedgehogs. The buddlea foliage is very silvery worth growing for that alone. I only planted the buddleia in June and it has put on so much growth I will have foliage for many more vases! Cathy, this is so accomplished and beautiful. I love the pale lemon aster and you make me want to live where you live! Thanks Julie. 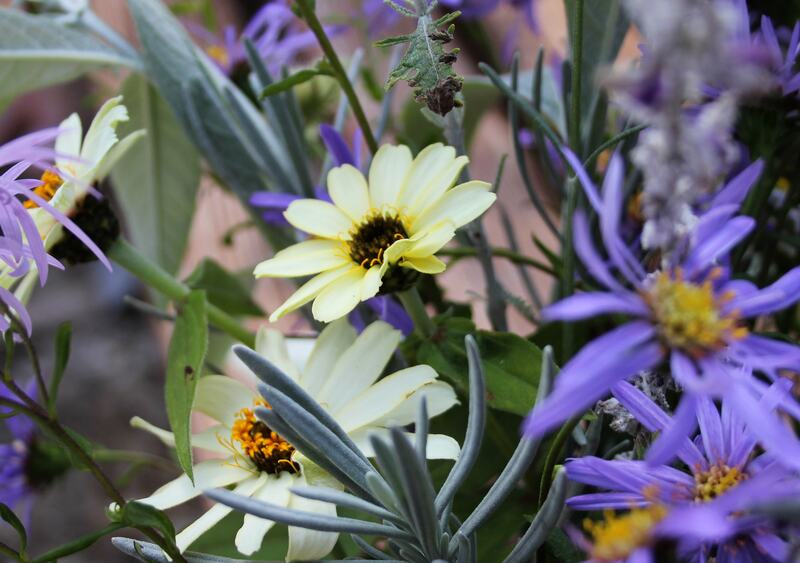 The pale creamy white flower is the zinnia, which was in a mixed packet of seeds – it looks more yellow in the photo than it actually is! Danke Uta! I hope it will be clear tonight too, but at the moment the fog is still hanging over our valley. I love your moonlight-themed flowers today and the background story adds to its charm. Thanks Susie. Full moon tonight, so hope the skies clear again! You have a way of putting together the perfect mix of little treasures from here and there throughout the garden. I love the mellow colors and that pale yellow of the zinnia is one of my favorites. I would have never thought to mix it with gray, it looks great! Thanks! I found that having a theme in mind made it easier to choose flowers that go together. I still often think I have nothing worthy of picking, but when I go out and really look there is so much! The zinnias have been lovely. I think I might grow them again after all. I thought the Aster pyrenaeus looked like Coreopsis. Wide petals for an Aster. Lovely color. The Aster pyrenaeus is the paler mauve aster with very thin petals. I think you were looking at the Zinnia – actually creamy white, but it does look quite yellow in the photos. Sadly I can’t grow Coreopsis – the slugs and snails love it! I really am addicted Janet! Yes, the buddleia has turned out to be a very good idea in a vase – lovely silvery tones and it seems happy once recovering from being cut. A beautiful and unusual colour conbination which reflects your theme. Thank you Christine. I probably wouldn’t have thought of using these colours if I hadn’t been out in the moonlight. You make your garden sound so romantic, Cathy, and inspirational. 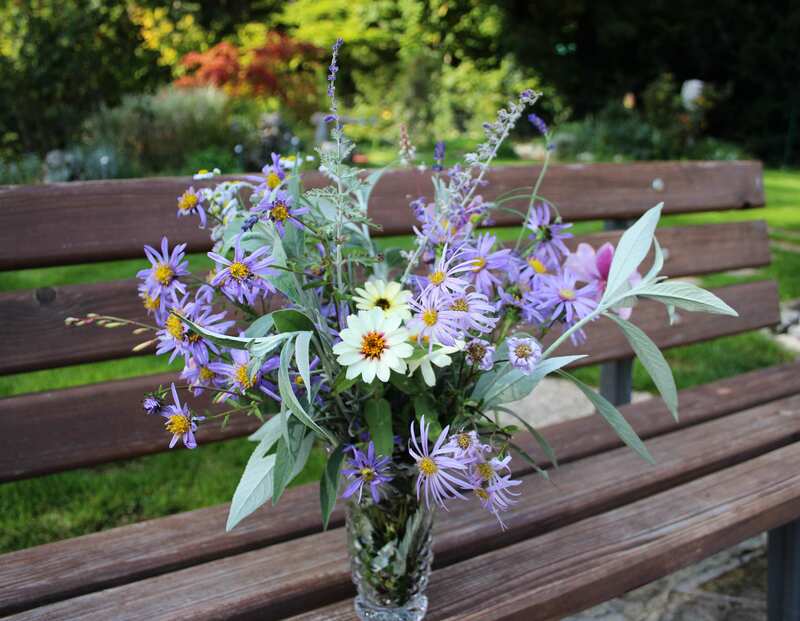 Your ‘Moonlight’ arrangement is beautiful and I like the use of buddleia leaves for a touch of silver, the perfect foil for the asters. 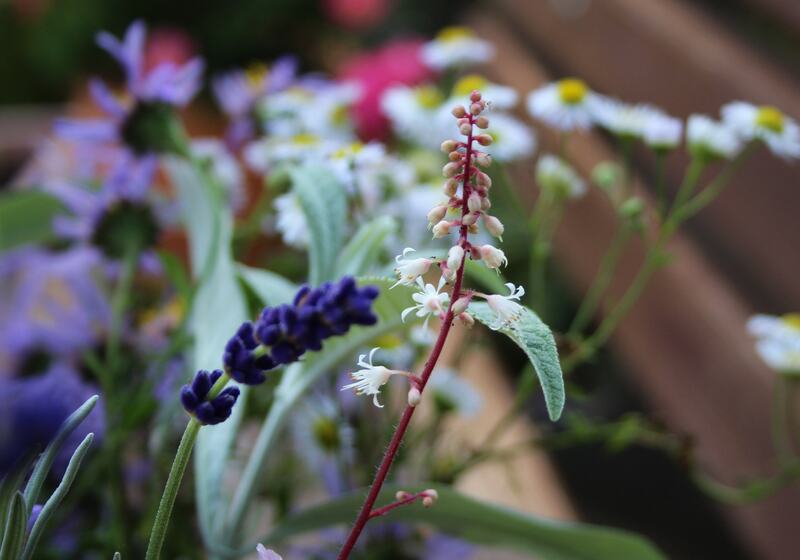 Thanks Elizabeth – the buddleia really was an inspiration and I’m sure I will be using it again soon! The flowers in your garden continue to look so fresh and that somehow surprises me. I guess I expect them to all be getting ready for a winter’s sleep! Beautiful, Cathy! And those precious little hedgehogs couldn’t be more adorable. I think I would love to have those little visitors. The raccoons raided our pond again last night, absolutely thrasthing the lilies. It always upsets me, however, I know that we attract them. I guess that’s our problem then, isn’t it? 🙂 Your description of the garden in the moonlight is simply ethereal. I could almost place myself right there! Lovely arrangement Cathy! Everything goes so well together. Thanks Simone! I really enjoyed putting this together! I love your ‘moonlight’ arrangement. How romantic. Seemed fitting with such a lovely moon the last few nights. It looked wonderful this evening encircled by a gold ring as it shone through the misty sky. Luckily I don’t know those songs, but now I have “Moon River” running through my head! LOL! Cathy, you really have the gift. 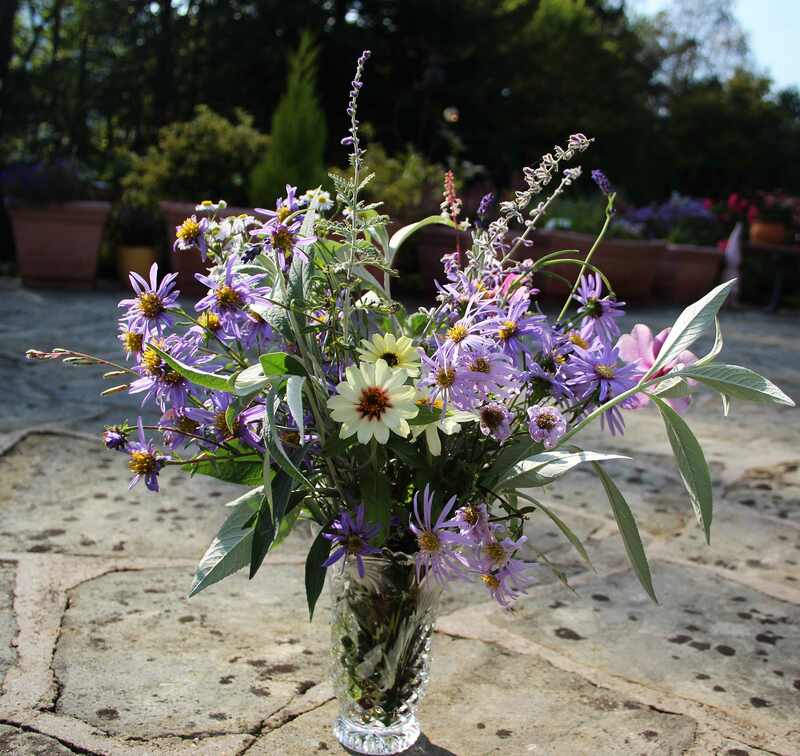 Both your garden and your flower arrangements are nothing less than superb. It’s a lovely vase, Cathy, but I enjoyed the link to the hedgehogs even more! They’re adorable and it’s wonderful of you to help the family make ends meet – it can’t be easy for the parents to tend to the needs of 9 offspring! We have no hedgehogs here – just voracious raccoons, squirrels, skunks, possums, coyotes and the scads of lizards. I think they are probably all fending for themselves by now, but they know where to come after a night of foraging if they still fancy a snack! The creatures you have sound like they could be troublesome – we are fortunate as the only ones we have to watch are the dormice who like to get into roofs and insulation for their winter quarters and can cause havoc. We are watchful! Hi Cathy, how lovely to be inspired by nature. Your backyard, and the area you live, sounds absolutely beautiful from your description of just the sounds of an evening! The moon has been so splendid the past few days (last night was incredible). Your flowers are beautiful, and so true, they are relaxing! The moon was really pretty last night here too Dana – through a misty sky I could see a golden ring around it – something to do with a moon eclipse apparently. The vase full looks so fresh and still Summery rather than Autumnal. I would love to be looking at this on my table. Having flowers indoors is so nice – can’t think why I never did this before joining Cathy’s meme! Very lovely Cathy – particularly the perovskia which you know I admire so much! Yes, the perovskia has been glorious again. But it will need trimming back soon 😦 All good things come to an end, as they say! Thanks Anna. It’s nice knowing the hedgehogs are there, but we haven’t seen any around for over a week now!